Click Here to Get Name and Address. Authentic traditional Mediterranean Greek Cuisine. Recipes and name included...could be a conversion to another concept, but this concept is growing. This is perfect for a Chef Owner operator and/or Family business! Customers really love this restaurant which has great reviews! Well Located right across from Major Military Base. The service station across the entry way is getting a major overhaul and with new street landscaping. This adds great appeal to the center and will attract more traffic to this restaurant. 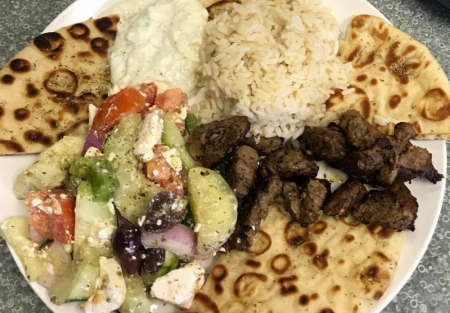 Menu: Menu Flavorful authentic Greek salad, Hummus, Dolmades, Gyros wraps, Grill items include Lamb-Chicken & Beef, Meatballs, Omelets, homemade tzatziki sauce , Rice & Fries... Greek Coffee-teas and more. The restaurant offers eat-in & takeout as well as catering. add Dinner ...Currently this is mostly lunch business as they close around 6pm. Kitchen has everything you need with an open line to the first dining area. Warm and clean dining areas...first dining area has seating next to the kitchen line and then there is a second larger more private dining area. This also serves for special events for staff parties as well. Rent: $4,200 for over 2,000 plus sqft. There is a counter for pick up orders... although they are full service. The sellers will train the new buyer. Currently seller is the chef. Reason for selling: Owners are getting closer to retirement and desire to be closer to family in SF due to a recent events.